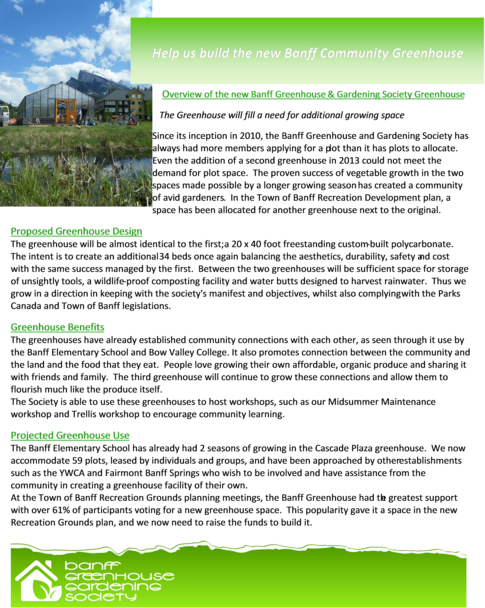 Throughout the first five years of the Banff Community Greenhouse and Gardening Society we have noticed a greater demand for greenhouse plots than we can match with existing space. With the addition of a second greenhouse after the first two years, the demand increased in line with the space available. Each year we hold the plot lottery, locals leave disappointed that they were not successful in winning a space. 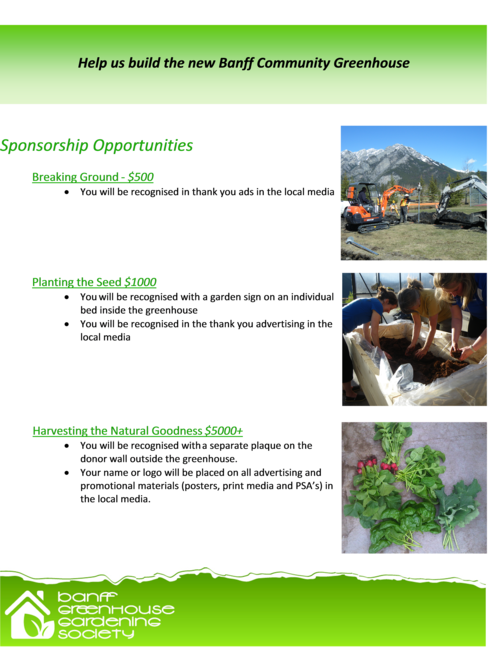 With each year, the interest in the community increases, and we have developed a program with the Banff Elementary school and Summer Fun group which provides kids with their own, specially designed plot to plant and maintain as a group. This year we also welcomed a group from the Bow Valley College to come and assist with plot maintenance and watering. The time for a new greenhouse is now, and we need some assistance in raising the money to build one. Your name or logo will be placed on all advertising and promotional materials (posters, print media and PSA’s) in the local media.